The picture was taken today, the 1st of July 2011, in Aosta, at 11:50 a.m. This is another candidate for APOD / Asterisk "Citizen Science". I bet alert readers can figure out this cloud type. (It might even be too easy.) Please -- have at it! Circulonimbus . . or have I invented a new cloud type? 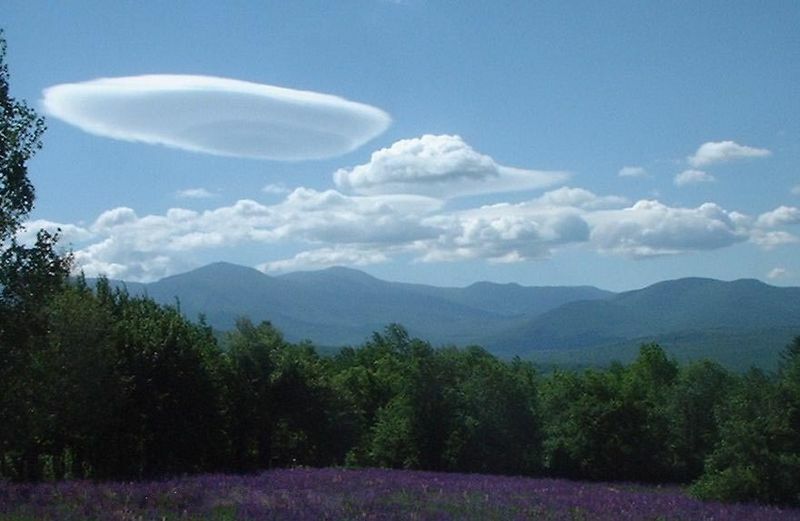 <<Lenticular clouds (Altocumulus lenticularis) are stationary lens-shaped clouds that form at high altitudes, normally aligned perpendicular to the wind direction. Due to their shape, they are often mistaken for Unidentified Flying Objects (UFOs). Last edited by neufer on Fri Jul 01, 2011 8:28 pm, edited 1 time in total. Contrail from a plane making a U-turn? Possibly a passenger flight that had an emergency (I've been on a flight where some of the hydraulics in the wings failed maybe 20 minutes after takeoff, and the plane did make a U-turn to return to the airport). Maybe a research or military plane? Given the proximity of the cloud to the mountains, I would not be surprised to find it fit this category. FKSR has my vote. I think it's a aircraft U-turn. Not necessarily an emergency turn but a scenic turn over the mountains. Smoke ring from a ground explosion? I also agree a contrail is very likely. I definitely don't think it is related to a lenticular cloud, because the droplet dynamics are so different (and I've seen thousands of lenticular clouds, but never one with a missing center). I wouldn't expect lenticular clouds over Italy in July, either. This may be a type of cloud referred to as a "Dorset doughnut." It appears to be a slightly distorted contrail from a plane in circular holding pattern. It's much larger than naturally formed annular clouds and the kicker is that it's far beyond the foreground mountain, but below the cloud deck, and so is quite low but also very large, just what you'd expect from a plane holding at something like FL3000. I don't think this is a contrail. The texture doesn't look like one, looks natural and different at different parts. The curve is too steep to be logical for an airplane, it's more than 180 degrees and the position above the mountains makes little sense to be a holding point for aircrafts. With the mountains below I'd say it is some kind of natural vortex formation. Here are two additional images of this cloud. These are a larger size than I usually post, and I apologize for that, but even so, I've cut them down a good bit from their original size and feel bad about that, too! The top one was taken before the bottom one; the cloud was expanding. The cloud is moving left to right. Why do you say it is expanding? The wine I had with dinner, perhaps? Cause: Saturation of air mass at upper levels, combined with strong wind immediately below cloud level. May indicate an approaching frontal system. <<This often spectacular variation of cirrus cloud is also known as hooked cirrus (uncinus is the Latin for hook), or cirrus mares' tails, a reference to the cloud's resemblance to a horse's tail. 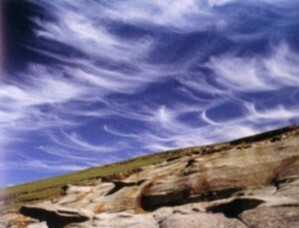 Cirrus uncinus forms in much the same way as other cirrus formations. However, its distinctive pattern of filaments is the result of a high-speed wind below the level at which the ice crystals form. As the crystals descend under the influence of gravity, this wind rapidly smears them across the sky, forming the distinctive, elongated, hooked shapes. Like other cirrus clouds, uncinus is a result of high-level moisture, and is therefore often associated with the approach of a frontal system. Since it is also evidence of a high-speed, high-level wind, it may indicate the presence of a jet stream. Normally, cirrus uncinus produces no significant weather on the ground, although snow showers may be visible immediately below cloud level. These usually evaporate well before reaching the ground and are therefore classified as virga. As cirrus uncinus generally indicates the presence of high- speed winds, pilots often associate this cloud with turbulence. In most cases, however, the turbulence would cause little discomfort to pilots or passengers. Excerpt from The Book " Weather "
what is the duration of this phenomenon (minutes, hours, etc.) in the Aosta Valley ? and this circular cloud was the first appeared ? The duration of the phenomenon was 5 minutes. This appearance is the first documented. I've received a few number of other similar appearance, but I didn't personally check.